El Policy Brief number 14 of europeG: "Climate change imposes a cost on future generations that the current generation has no direct incentive to fix, giving shape to what Mark Carney, President of the Financial Stability Board (FSB) and Governor of the Bank of England, has called the “Tragedy of the Horizon”. To address this paradox, and above all to engender the necessary incentives, what better course of action than to have the financial markets put a price on the objectives and commitments agreed to at the Paris Summit? However, to reach this point, providing greater information transparency has first to be achieved. And there are, unquestionably, major information deficiencies in the case of climate-related financial risks." 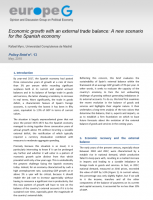 Policy Brief number 13 of EuropeG focuses on: “Economic growth with an external trade balance: A new scenario for the Spanish economy”. By year-end 2017, the Spanish economy had posted three consecutive years of growth at a rate of more than 3% per annum while recording significant surpluses both in its current and capital account balances and in its balance of foreign trade in goods and services, the latter showing a tendency to increase in real terms. More significantly, the trade in goods deficit, a characteristic feature of Spain’s foreign accounts, is currently the lowest it has been in fifty years, equivalent to 1.9% of GDP in terms of current values. Policy Brief number 12 of EuropeG focuses on "Size and productivity of the Spanish company, the forgotten resource of the quality of management". Its authors Emilio Huerta (Public University of Navarra), and Vicente Salas (University of Zaragoza) analyze the reality of SMEs in Spain, compare it with other countries of the European Union and conclude with the recommendation that productivity should star in the debate on growth and the business dimension. This document, elaborated by the economist Santiago Carbó, discusses in detail the banking union implementation framework in this first stage. Furthermore, compares its different application in Spain and Italy, while revealing other weaknesses related to the very environment of the European banking union, the absence of the deposit protection scheme and the emergence of the fintech competition. EuropeG's Policy Brief number 10 was prepared by Martí Parellada, a member of EuropeG and Luis Sanz Menéndez, a CSIC researcher at the Institute of Public Goods and Policies, entitled "The whys and wherefores of R&D+I policy. The situation in Spain". It analyses in detail the impact of the crisis on investment in Research, Development and Innovation in the global and European context and asks what should be the applicable reforms so that the Spanish economy reaches at least the objective marked by the Spanish Government, of devoting 2% of GDP to R&D in 2020. This Policy Brief is focus on two highly relevant issues: First, the role of international confidence in Spain’s ongoing recovery and, thus, indirectly, the role of internal reforms, specifically those affecting the governance of the euro and the activity of the ECB. In fact, this radical shift can be identified as the hinge that separates the second recession (2011-2013) from the growth stage (2014-2016), a diagnosis for which there is already broad consensus (European Commission, 2016c). Second, we examine the role being played by domestic and foreign debt in the recovery, given their importance in the origin of the problems underlying the euro crisis (European Commission, 2016A). This policy brief offers a description of the changes that the banking systems of the eurozone have been exposed to in recent years in terms of both their structure and regulatory framework, with particular attention to the European banking union, the most important project to have been initiated in the last thirty years. It then analyses the basic features that characterise these systems today and identifies the main challenges they face in the immediate future. The Great Recession has revealed, firstly, that fiscal stabilising instruments remain essential and, secondly, that these must be set up at eurozone level, given their limitations at national level. It is the absence of such stabilising instruments that accounts in part for the severity of the austerity policies applied in some countries. The creation of this European stabilising instrument is a priority issue, after the experience to the Great Recession, and its implementation could be a very significant first step towards a genuine fiscal union. The Banking Union must overcome the risks of perverse link between sovereign debt and banking stability so that taxpayers do not return to bear most of the costs of banking crises. The Spanish economy is emerging from the tunnel of the second recession. The external financing situation has improved substantially, and the forecasts for activity and employment anticipate a new cycle, although its strength remains to be seen. Structural reforms are essential to ensure the competitiveness of the Spanish economy. Among them, the reform of university legislation to promote excellence, competitiveness and internationalization of the university system plays a key role. The euro crisis has put progress toward a fiscal union at the centre of the European debate. At first reluctantly, then ever more clearly, a fundamental consensus seems to have been reached on the need to move toward this fiscal union and on the idea that there will be no monetary union if it is not accompanied by fiscal union. The Spanish economy is immersed in a crisis which reflects the various effects of a series of shocks which have altered the behaviour of the supply and demand factors which drove Spanish GDP growth in previous years. The current eurozone crisis is the main threat to monetary union, to the single market itself and, probably, to the global economy as a whole.